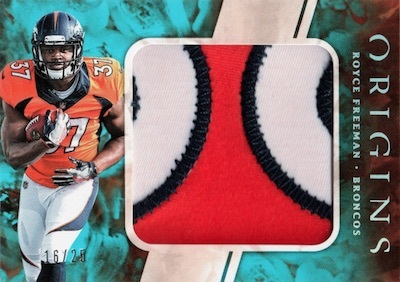 Thanks to a specific design style and hard-signed content, 2018 Panini Origins Football has emerged as a popular early-season NFL release. Matching the 2017 product, each 2018 box averages one on-card rookie autograph, one jumbo rookie patch autograph and one memorabilia card that is either jumbo-sized or a patch. 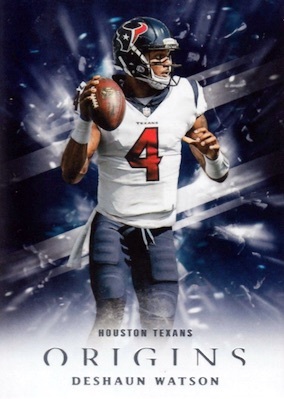 2018 Panini Origins Football includes a base set and parallels that account for four cards in the seven-card box. Highlighting first-years stars, the 2018 Panini Origins Football checklist offers multiple hard-signed sets, including Rookie Autographs with Red (#/99 or less), Blue (#/49 or less), Purple #/32 (First Off the Line) Turquoise (#/25 or less), Gold (#/10 or less), Green (#/5 or less), and Black (1/1) parallels. 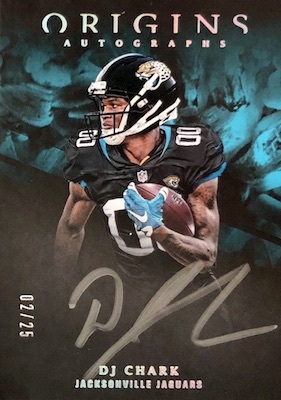 Switching up the ink colors, the Origins Autographs line displays Bronze Ink (#/99 or less), Silver Ink (#/25 or less) or Gold Ink (#/10 or less). Specific to the big three offensive positions, the signed Passing Stars, Receiving Stars and Rushing Stars inserts also feature limited inscription versions that add notable college stats. The four-player Quad Rookie Autographs set is also grouped by position with key quarterbacks, running backs and wide receivers. 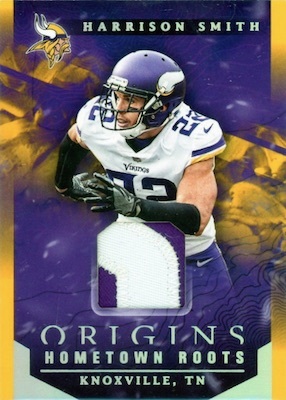 In addition, book cards account for more of the on-card content in 2018 Panini Origins Football. 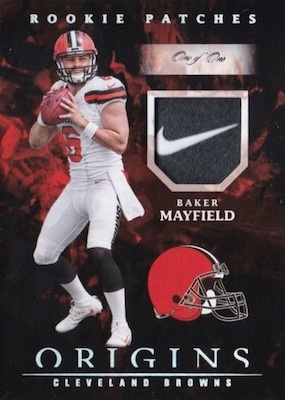 Options consist of the Rookie Booklet Patch Autographs for a single player or the multi-subject Six Star Signature booklets. There are also Rookie Stars Dual Signatures booklet cards. 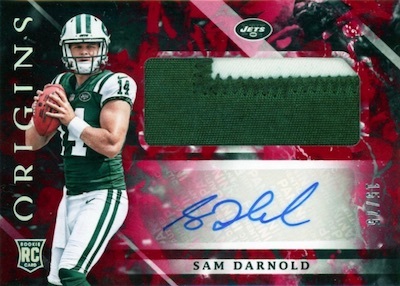 Finally, averaging one per box, the Rookie Jumbo Patch Autographs cards come in Red (#/99 or less), Blue (#/49 or less), Turquoise (#/25 or less), Gold (#/10 or less), Green (#/5 or less), and Black Brand Logo (1/1) editions. 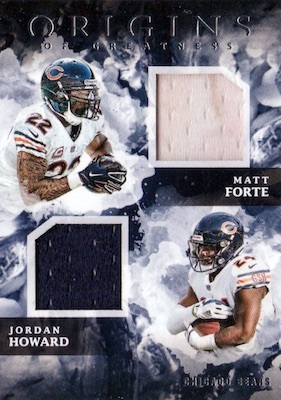 Filling the third hit in each Hobby box, memorabilia cards include Rookie Jumbo Jerseys. 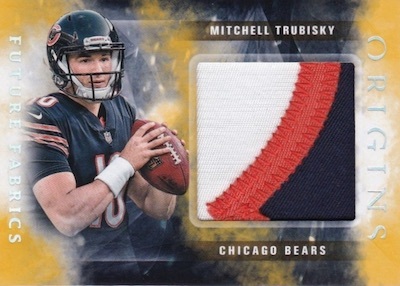 These have Red (#/99 or less), Orange (#/75 or less), Blue (#/49 or less), Turquoise (#/25 or less), Gold (#/10 or less), Green (#/5 or less), and Black (1/1) parallels. PARALLEL CARDS: Red #/299, Orange #/175, Blue #/99, Turquoise #/25, Purple #/13 (FOTL), Gold #/10, Green #/5, Black 1/1, Printing Plates 1/1. PARALLEL CARDS: Red #/99 or #/75, Blue #/49, Turquoise #/25, Gold #/10, Green #/5, Nike Swoosh 1/1. *LAMAR JACKSON PARALLELS*: Red #/25, Blue #/10, Turquoise #/5, Gold #/3, Green #/2, Nike Swoosh 1/1. 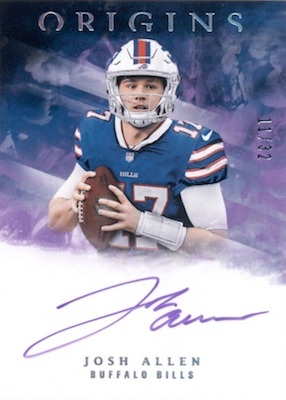 Buy 2018 Panini Origins NFL autographs on eBay. PARALLEL CARDS: Silver Ink #/25, Gold Ink 1/1. PARALLEL CARDS: Red #/99 or less, Blue #/49 or less, Purple #/32 (FOTL), Turquoise #/25 or less, Gold #/10 or less, Green #/5 or less, Black 1/1. PARALLEL CARDS: Gold #/10 (Lamar Jackson #/5*), Gloves #/2, NFL Shield 1/1, NFL Tag 1/1. PARALLEL CARDS: Gold #/5, Green #/2, Black 1/1. PARALLEL CARDS: Gold #/10, Green #/5, Black 1/1. PARALLEL CARDS: Red #/99, Orange #/75, Blue #/49, Turquoise #/25, Gold #/10, Green #/5, Black 1/1, Laundry Tag 1/1, NFL Shield 1/1, Nike Swoosh 1/1. PARALLEL CARDS: Red #/99, Orange #/75, Blue #/49, Turquoise #/25, Gold #/10, Green #/5, Black 1/1, NFLPA Tag 1/1, NFL Shield 1/1, Nike Swoosh 1/1. View the full 2018 Panini Origins Football checklist spreadsheet. by using very similar designs every year we are always reminded of Topps inception..
which was the predecessor of this Brand before exclusivity happened..
2018 Panini Origins Football Hobby Box - Factory Sealed!